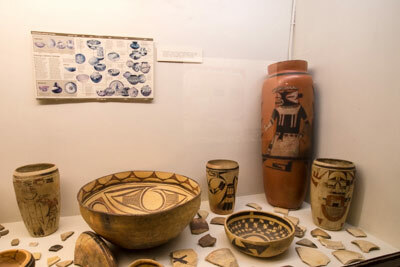 Spread across three mesas in Northeastern Arizona, the Hopi Arts Trail highlights galleries and cultural attractions along Highway 264, just east of Tuba City. It makes a great add-on to a Grand Canyon adventure, or a nice diversion from busy Interstate 40. That said, the reservation is considered sovereign land, and as such residents aren’t subject to U.S. laws. For the most part, this doesn’t effect the average traveler; however it’s important to note that the Americans with Disabilities Act doesn’t apply there. On the plus side, sales tax isn’t charged either, so it’s rather a mixed bag. As you can imagine, access is varied along the route. Clearly there are some historic galleries which are not accessible. On the other hand, some businesses have made their shops accessible, either out of respect for their disabled elders, or just because they want everyone to be able to patronize them. Bottom line — it’s worth a gander, as the scenery is beautiful and it’s a great way to get off-the-beaten-path, meet the locals and learn about the Hopi culture. One of the best places to access the Hopi Arts Trail is from Interstate 40, just east of Winslow. Take Highway 87 north until it dead ends, then turn left. Just up the road you’ll spot the Hopi Cultural Center (928-734-2401, www.hopiculturalcenter.com) on your right. As an added bonus, the drive is very scenic as the road climbs up to the second mesa. Unfortunately there are no pullouts along the way, but the windshield views are fabulous. Accessible parking is available near the door, with level access to the cultural center and restaurant. The women’s restroom has a tight corner and a narrow stall with grab bars, but most wheelchair-users would have a difficult time accessing it. The men’s restroom however, doubles as a family restroom, and has plenty of room to navigate a wheelchair, and toilet grab bars on the back and right walls (as seated). The museum houses a eclectic collection of historic and contemporary artifacts, including kachina dolls, pottery, baskets and jewelry. 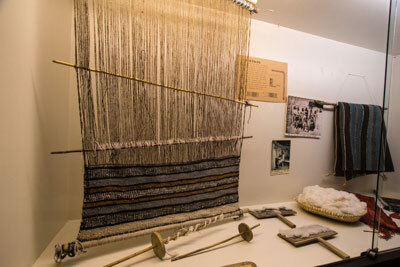 There is also a model of Kawestima, the ancestral pueblo, as well as traditional clothing and tools. But by far the highlight of the exhibition is the collection of old photographs, showing the Hopi people at work and play. They help put a little perspective on the people and their traditions, and give some insight into the culture. Just up the road on the third mesa, you’ll find the Monogya Gallery, which has added some access features. It’s about seven miles from the Hopi Cultural Center, at the west entrance to Oraibi. It’s hard to miss, as there aren’t many buildings along the way, and the signage is good. Although the parking area is dirt, it’s level, and there’s usually plenty of room to park near the entrance. The ramp up to the entrance may be a bit steep, but it’s certainly doable with a little assistance. Inside, there is barrier-free access to most areas of the shop. They have an excellent selection of wares, including several cases of jewelry, in all price ranges. The basket work presented is beautiful, and they even have some woven napkins and placemats. The prices are very reasonable for the quality of the merchandise. Best of all, the owners are very friendly and happy to chat about their creations. After you leave the gallery, the rest of the drive to Moenkopi is very scenic. The whole route, from Winslow to Moenkopi is only about 125 miles, so it’s certainly a doable afternoon side trip. Take your time and stop along the way to admire the beautiful scenery, but be respectful. Remember, this is all private property. It’s also a good idea to check your gas gauge before you leave Winslow, as there are no gas stations along the route. 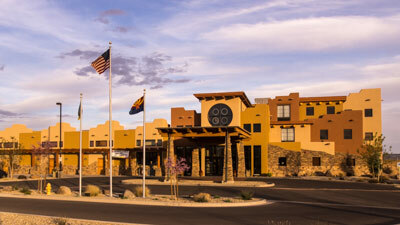 If you’d like to spend the night on the reservation, and perhaps explore the first mesa the next day, Moenkopi Legacy Inn & Suites (928-283-4500, www.experiencehopi.com) is a good lodging choice. It’s located at the junction of Highway 264 and Highway 160, on Hopi land, just across the street from Tuba City. This is the first hotel built on Hopi land in 50 years, and the pueblo style building blends in with the surrounding landscape. Access was taken into consideration during the construction, and there is barrier-free access to the spacious lobby, from the nearby accessible parking area. 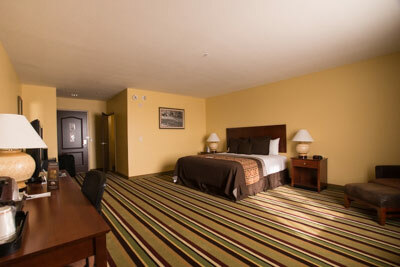 There is elevator access to all floors, and good access to the public areas. Room 209 features wide doorways and good pathway access. It’s furnished with a 25-inch high king-sized bed, a desk, an armoire, an easy chair, a refrigerator and a microwave. And even with all that furniture there’s still plenty of room to maneuver a wheelchair. 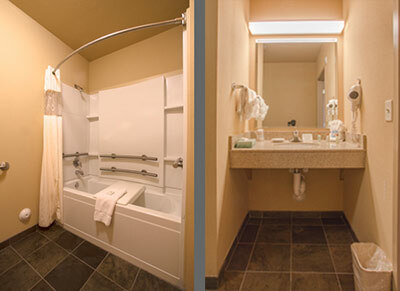 The bathroom has a tub-shower combination with grab bars on three walls, and a 19-inch high transfer bench across the tub. 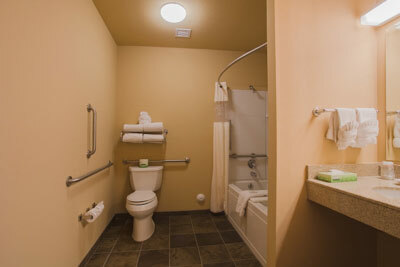 Other access features include a roll-under sink and toilet grab bars on the right and back walls. There’s plenty of room to roll around in the spacious bathroom; and although the property doesn’t have any rooms with roll-in showers this room will work for many people. Although I don’t like to get into the politics of a particular people, in this case a little primer is helpful. Tourism and development of the native land is quite the controversial subject among the Hopi people. Just pick up the local newspaper and you’ll read very vocal views on both sides, with plenty of opinions in between. That said, the Hopi are a very clan-oriented people, so recommendations (verbal and in print) on shops, galleries and guides are largely dependent on the person recommending them. In other words, people are likely to recommend someone they know well, and who is like minded. This can actually work to your advantage and help you discover some of the lesser known artists and galleries in the area — the ones that didn’t make the glossy brochures. 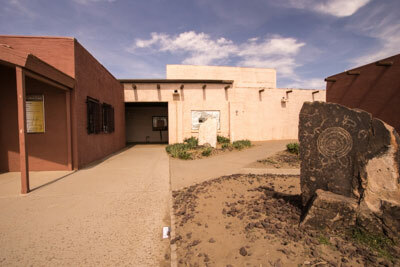 With that in mind, I decided to ask the clerk at the Hopi Cultural Center for gallery recommendations. I told him I was particularly interested in jewelry, and right off the bat he suggested Manongya gallery. And I have to say that he was spot-on in his recommendation. Had I not made that inquiry, I probably never would have discovered that hidden gem. So don’t be shy about asking for recommendations. This is an emerging destination, and not all of the artists are featured in the brochures. ‹ Getting Around DC	› What is Pre-Check and How Can I Get It?